When was the last time you felt like skipping down the road, just because you felt happy and alive? When you just felt at complete ease with yourself, loving the moment you were in? When you felt open, energized, light and free? I will do my very best to give you this feeling each time I see you. But, as you know, nothing worth having in this life comes free. To get results, we have to put in the effort. Hence BraveBodies. I am here to help you build a healthy and fit body, the perfect home for a healthy mind. Mens sana in corpore sano, as the Latin proverb says. I pledge to help you strengthen muscles that are weak, relax the ones that are tight, straighten your collapsed back and open your hunched shoulders. I will work with you on toning up your belly and waving bye-bye to any potential bingo-wings. I will make you feel muscles you never knew you had, and will quiz you relentlessly on the right position of any thinkable body part until I see that you are becoming AWARE of your body. Aware of how you stand, sit, walk, jump, breathe, roll over, lunge, how you bend over and lean back. Awareness is the key to self-control. When we are aware, we can self-correct, change ingrained habits, and build a whole new us. BraveBodies classes are down-to-earth and goal-oriented — the goal being a stronger, leaner, suppler, youthful and more agile you. I am not willing to fritter your time away — we move so little already in low-challenge environment. I will ask you to work hard. I expect that you do your best in the given time. Your very best will be different from the person standing next to you, and that’s to be expected — and respected. What matters is the commitment to make the most of your time on the mat. 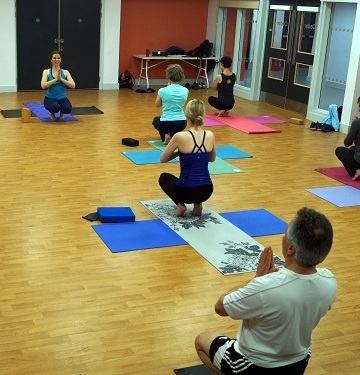 If you’d like to join, I run yoga and Pilates classes in Woolston and Lowford (Southampton) every Monday, Tuesday and Wednesday. I also run a monthly workshop in Southsea, Portsmouth. My name is Barbara Helis-Bailey. I live in Southampton, Hampshire, with my son and my husband, and enjoy my English life as a long-standing Czech expat. I first became interested in yoga when I was about fourteen, when, as any teenage girl, I was quite conscious about my appearance and eager to do anything to come closer to my body ideal: thinner, leaner me. Today I feel fortunate that it was yoga I stumbled across in my vanity search, as opposed to some other discipline. I had no idea about the benefits yoga would bring into my life; I just wanted to look good and be skinny, period. The inspiration for trying yoga came in the form of a book called “Raquel: The Raquel Welch Total Beauty and Fitness Program”. It fascinated me: Raquel, then already in her late forties, looked twenty years younger, graceful in poses that seemed to defy gravity and turn her into an almost supernatural being. She became my icon of eternal youth and beauty. Looking at these images of perfect mind and body control, I intensely wished I could become like her. I started practicing her sequence every day, and eventually got very good at it. Back then I had no idea I was practicing Bikram yoga, only without the heat. I did it religiously for several months, every day for about ninety minutes. I loved the way the exercise made me feel: it was as if I had taken some form of internal shower. I was centered and in peace at the end of each practice… and also very tired! As a child and a teenager, I suffered from an acute form of scoliosis, a condition where the spine curves sideways and causes various asymmetries in the body, shifting the position of hips and shoulders, which all means trouble. I grew up very quickly and my spine didn’t adapt well to the sudden length of my body — my muscles were too weak to keep everything in place. I spent three months in a spa (sounds lovely, doesn’t it?) when I was thirteen where I got massages, hot baths and did some rehabilitative exercise, but it didn’t help much. When I was fifteen, an orthopedist told me I would need a plastic cast. Imagine a small plastic bathtub with an opening in the front — I felt like a turtle! The cast completely restricted my movement; I couldn’t bend over, turn around or even sit comfortably, as this dreadful thing pressed very hard onto my ribs when I sat down. It made my hips so large that I couldn’t put any trousers on, and my waist was two inches thicker. Talk about a confidence booster! I was supposed to wear this contraption all day, every day until I turned eighteen — for three years!! Fortunately my mum had some common sense and the “bathtub” ended up where it deserved to be… in the communal bin. So that was that. My only solution to my problem was to try to fix it myself. I continued with yoga and felt taller and more limber and open as I went along. My only problem was that I had no teacher besides books, and although books are wise and lots can be learned from them, a teacher with experience is absolutely vital when beginning a practice. I had nobody to check my alignment, to tell me not to work so much on my already good flexibility and focus instead on building strength, or to give me the right kind of adjustment or modification. When I look back now at what I used to do and the wrong technique I used, I cringe. Today, I have to say I have one of the best jobs in the world. I work with people in a pleasant, relaxing setting, offering them an opportunity to do something for themselves and help them as best as I can. I meet people from all walks of life and have made great friends — who still come to my classes! My back is happy and I have no pain at all — and I am fitter and stronger now than I was ten years ago. Goodbye computers! Goodbye office chairs! And the best thing of all… I still keep on learning.